The New Administration of a Fine Arts Education is a conversation series with leading individuals in contemporary art, culture and education who engage in multiple and overlapping artistic and pedagogic practices. The exhibitions, actions, writing and artworks made by the artists included in this conversation series are at times seamless integrations of cultural production, lifestyle, studio and teaching. Some of them operate from inside or in coordination with art education institutions, challenging tradition from within. Others combine education and creative economic strategies to sustain practices in the realm of contemporary art and beyond and to realize new institutions. In all cases they are dismantling, intentionally or not, rigid definitions of what it means to be an artist, curator and educator today. The series and accompanying publication intend to consider prescient questions related to contemporary cultural production and models of education. What exactly is a cultural producer? How has the portrait of the solitary artist working in the studio been reshaped as the artist simultaneously making objects, writing, curating and teaching? What are the challenges posed by these interchangeable and expanding identities and platforms? The participants in The New Administration of a Fine Arts Education represent diverse but complementary points of view for considering these questions and others. Jon Rubin is a multidisciplinary artist whose work explores the social dynamics of public places and the idiosyncrasies of individual and group behavior. His solo and collaborative projects include creating a game show for ideas, opening a fake store in an indoor shopping mall, starting a restaurant that secretly operates via take-out orders from its double across the street, broadcasting an office's telephone conversations through a talking piano, running a neighborhood truck that gives away free homemade goods and services, operating a radio station that only plays the sound of an extinct bird, and developing a free, nomadic art school. He has exhibited at the San Francisco Museum of Modern Art, the Museo Tamayo de Arte Contemporáneo in Mexico, the Rooseum in Sweden, the Internationale Kurzfilmtage Oberhausen in Germany, and the Nemo Film Festival in Paris. Rubin is an assistant professor at Carnegie Mellon University in Pittsburgh. Matthew Higgs is an artist and curator based in New York City. He is director and chief curator of White Columns, New York’s oldest alternative arts space, founded in 1970 by Jeffrey Lew and Gordon Matta-Clark. Higgs has curated numerous exhibitions of international art, served as a curator at the CCA Wattis Institute for Contemporary Arts, and has contributed to the journals ArtForum and Frieze, among many others. As an artist, he has exhibited widely with recent solo exhibitions in New York, Vancouver, and London. He has taught in the curatorial practice program at California College of the Arts. J. Morgan Puett is known for her distinctive fashion designs and installations. Her large-scale collaborative projects engage communities, local cultures, and historical sites, drawing from traditions of costume, labor, personal appearance, and adornment. Recent projects have been commissioned by the Queens Museum of Art, the Santa Barbara Contemporary Art Forum, MassMoCA in North Adams, MA, the Fabric Workshop and Museum in Philadelphia, Wave Hill in the Bronx, and the Serpentine Gallery in London. Puett and the artist Mark Dion operate Mildred’s Lane, an educational and cultural institute located on their 96-acre farm in the Upper Delaware River Valley in rural Pennsylvania. Both indoors and in the landscape, Mildred’s Lane presents workshops, readings, performances, screenings, temporary exhibitions, and architectural installations. Central to the project is a connection between research, working, making, and living with art. Michael Mercil is an artist and a professor of art at the Ohio State University (OSU) in Columbus. Mercil has recently exhibited at Socrates Sculpture Park in New York, the Fabric Workshop and Museum in Philadelphia, and Columbus Museum of Art. His practice reflects interests in the intersections of agriculture and urbanism, searching for sustainable ways of inhabiting land. As part of his ongoing investigations with the Initiative for Living Culture, Mercil’s public works “The Beanfield” and “The Virtual Pasture,” produced in partnership with the Wexner Center for the Arts, the OSU Department of Art, and the Social Responsibility Initiative in the College of Food, Agricultural, and Environmental Sciences at OSU, consider the original history of OSU’s land as a site of agricultural production. Jon Rubin speaks about his practice as part of The New Administration of a Fine Arts Education. Organized by Bureau for Open Culture for Columbus College of Art & Design. Matthew Higgs speaks about his practice as part of The New Administration of a Fine Arts Education. Organized by Bureau for Open Culture for Columbus College of Art & Design. J. Morgan Puett speaks about her practice as part of The New Administration of a Fine Arts Education. Organized by Bureau for Open Culture for Columbus College of Art & Design. Michael Mercil speaks about his practice as part of The New Administration of a Fine Arts Education. 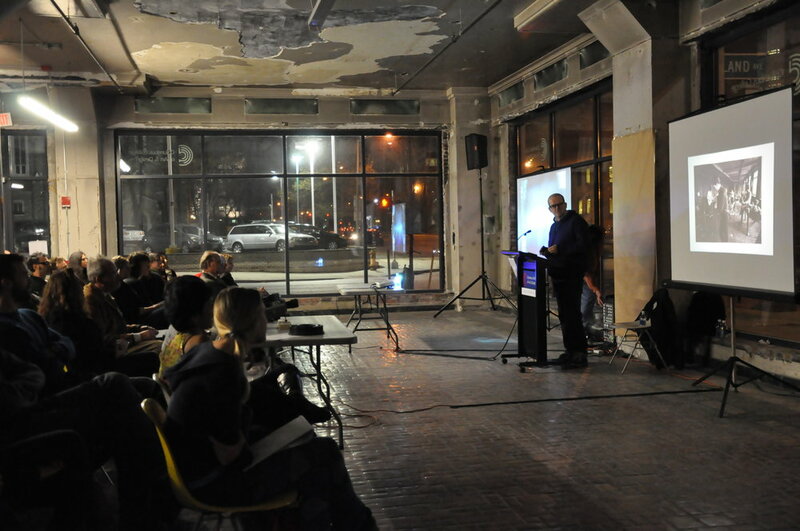 Organized by Bureau for Open Culture for Columbus College of Art & Design.